A half day ride to settle in and prepare for the days to come. Route is through the fynbos mountains, along the Kraaibosch dam, through Light canters along farm tracks take us back to Farm215. This ride is a circular route around Baviaansfontyn. Walking along mountain streams, passing by Milkwood and Afro-montane forest on the way to Flower valley. This valley is filled with vast fynbos and indigenous forests. It is home to a Unesco supported project for sustainable fynbos harvesting and education. Breathtaking views of the ocean and fynbos mountains. Ride can be done morning or afternoon. Rest of the day is spent lounging, reading and eating in the wonderful valley of Bodhi Khaya. Or treat yourself to a massage. Here the stillness is all encompassing. We will pass through Grootbos Fynbos Nature Reserve, famous as a botanical hot-spot. Before we reach De Kelders (Gansbaai – a fishing village) we will head west through the coastal shrubland and traverse the vast magical almost surreal sand drifts (Grys Dunes) of die Plaat. The mysterious landscape will give way to the beach. 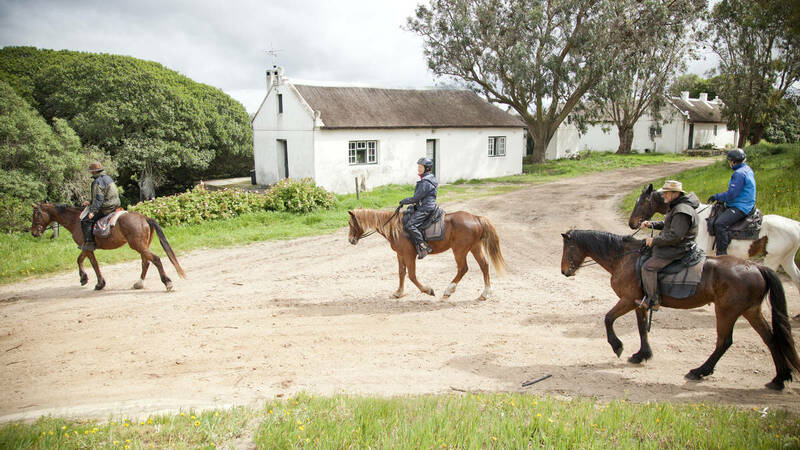 We ride through the Walker Bay Nature Reserve to the unspoilt white beaches of the Walker Bay whale sanctuary. This is arguably the best land based area in the world to watch Southern Right whales (whale watching capital of the world from June to December – whales and their calves often come within metres of the coastline). Admire these magnificent creatures and their ‘aquabatic’ displays, splashing, crashing and blowing, breaching, lobtailing, spyhopping and sailing close to shore. Enjoy the long, sandy beaches and experience the thrill of beach gallops. Halfway to Hermanus, we turn into the D3wns and head for the Kleinriver and the oasis of Stanford. We sleep at Stanford River Lodge with time to swim and canoe in the river. A day of some leisure. A Fast half day ride to the beach and down to the Kleinriver lagoon, a magnificent body of water with a beautiful backdrop of mountain and an abundance of birdlife. Coming back, we laze on the rivers edge , swim or take a canoe on the river, eat and replenish. What to WearIt is important to ride in the equipment and clothing you are used to and not try new items on a multi-day trail. Short Boot with a rubber sole is preferable to smooth leather sole of equestrian riding boot. Guests or SpectatorsNo Spectators allowed, only paying guest allowed on trail. Riders must be confident and comfortable at trot and canter. Physically fit and prepared for long hours in the saddle under an African sun. Trail has two half days for relaxation and body rejuvenation. Riders should not be carrying any recent injuries or other debilitations.